Women often worry that lifting weights will make them ‘big and bulky’. However when it comes to strength training for women there are many misconceptions. If you are like most women regular strength training is unlikely to make you bulk up…WHY? Women’s bodies respond differently to strength training. Generally when women lift weights as part of their weekly exercise program they find they develop a stronger, leaner physique but they do not bulk up. The reason why is due to major differences between men and women’s hormonal makeup. Men have a far greater concentration of testosterone. This is the chief hormone that makes them manly. It is termed an anabolic hormone and this ‘building’ hormone allows men to gain muscle more rapidly, especially when they do regular weight lifting. Women on the other hand have far less testosterone making it difficult to dramatically increase muscle mass. 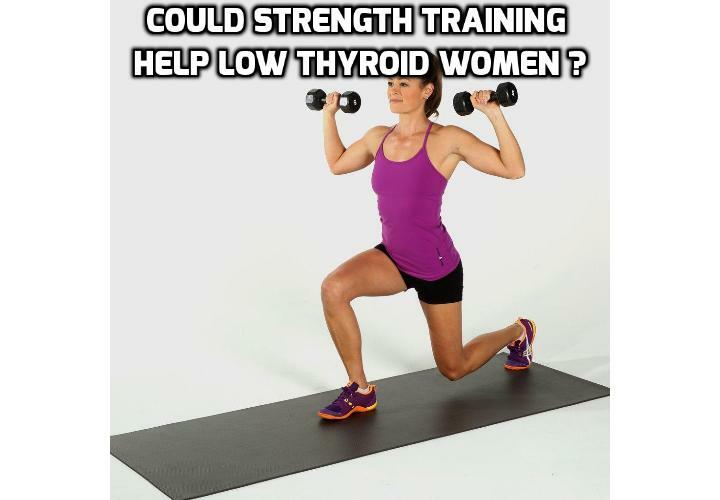 Strength training can be very beneficial, particularly if have a low thyroid condition. Muscles are an important factor in raising your metabolism as muscles burn far more calories than body fat. A greater amount of muscle really fires up your metabolism. The result is more calories are used for energy, which in turns means you lose weight. This form of exercise is also the most effective way to help strengthen your muscles that tend to ache and get stiff when you have a low thyroid disorder. Not only that, strength training can give you gorgeous toned curves and will help prevent bone and muscle breakdown which occurs naturally with aging. So if you are getting sick of sweating over the cardio equipment at the gym why not hit the weights area and do a strength training session? To get toned and super lean most experts recommend doing a planned strength training workout a minimum of 2-3 times per week. Always work within your limits especially on days when you feel more fatigued. It is also possible to maximize your strength training efforts with a post-workout protein shake. Just blend a good quality protein powder with a handful of fresh fruit within 30 minutes of finishing your routine. This will fuel your recovery; protein builds and repairs muscles and the carbohydrates from the fruit will provide the all-important energy for recovery. Previous PostPrevious Thyroid Remedy – Is Taking Too Much Bladderwrack Dangerous?